You will need to obtain a medical examination if you are applying for certain Australian visas. If you are going to apply for a partner visa or fiancee visa then you will have to have this exam. The medical exam you will have to pay for and you will need to obtain this examination when told by the case officer to obtain it. 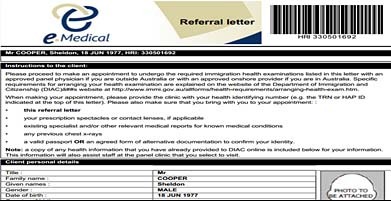 Australian Immigration has their panel physicians for each country. You will need to obtain this information when the time comes. Search this website for more information on panel physician in your country. Most medical results are now submitted online so you dont need to wait for documents as it will be forwarded by the doctor directly. If you are going to book a medical appointment with an eMedical enabled clinic, you must provide a health identifier (HAP ID). We also encourage you to use eMedical Client before your appointment. Note that most clinics and hospitals would have expected you to have completed the eMedical Client process online. You should do this before you ring a panel clinic to book an appointment for your health examination. If you lodge an electronic visa application or use the My Health Declarations service, you can access eMedical Client via ImmiAccountafter lodging your online application or form. You just need to click on the Organise your Health Examinations link which will display under ‘next steps’ for you online application or form. If you don’t have an ImmiAccount and need advice about how to create one, see About ImmiAccount. 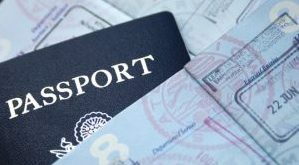 If you lodge a paper visa application, you need to access the login screen at eMedical Client Login. Enter your family name, HAP ID and date of birth. 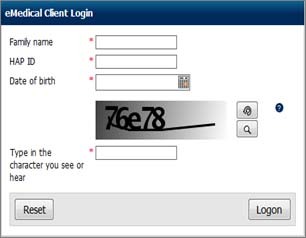 Enter the CAPTCHA characters that you see or hear and click ‘logon’. You will note that on the first page of the eMedical Client on your screen, if you are required to complete a medical examination, you will also see medical history questions that you need to answer. You can select ‘Answer No to all’ at the top right of the screen to default the answer for all questions to ‘no’. You can then select ‘yes’ to any answer where appropriate. If you select ‘yes’ you must provide more details. 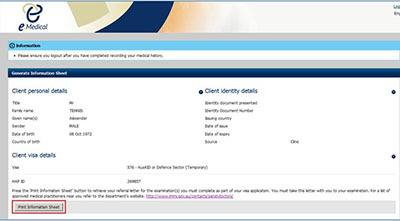 At the bottom of the page on the screen, you will now need to declare that you have read and also understood that the eMedical Client Declaration and that you have given consent for your medical information being submitted electronically to the department. The Generate Referral Letter screen will appear. Click on the Print Referral Letter button at the bottom left of the screen to retrieve your eMedical referral letter. You can then print the letter.